The Sri Lankan government has begun advertising for the post of hangman this week, after the president vowed to implement capital punishment, following a state visit to the Philippines. Maithripala Sirisena has repeatedly backed the use of the death penalty telling an audience in Mullaitivu last month that he had no “fear of NGOs” and praised the much criticised campaign against drugs led by the Philippines president Rodrigo Duterte. 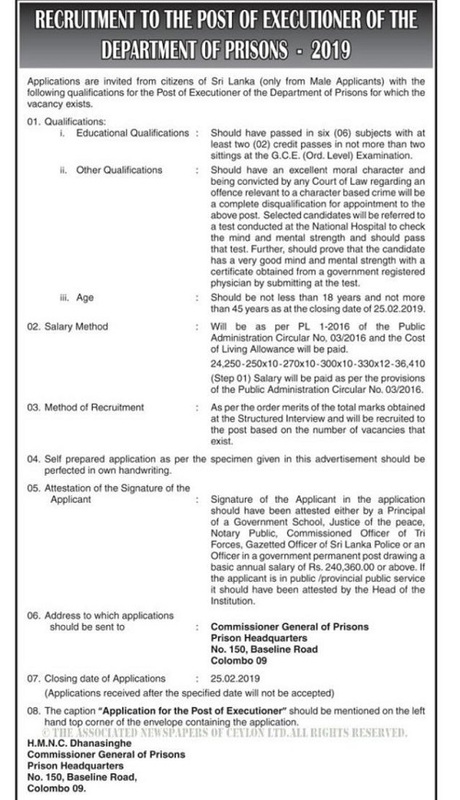 An advert in the state-run Daily News offered a wage at 36,310 rupees for the job, stating that two vacancies were available. It went on to specify that candidates should be male, and have both “excellent moral character” and “mental strength”. There are currently 436 people on Sri Lanka’s death row, including at least six women. See the advert placed in the paper below. Also see more from Reuters here.